Step 1 In a large skillet, heat 1 teaspoon of the olive oil over medium heat. Add chile peppers; cook about 3 minutes or just until tender, stirring occasionally. Stir in beans, corn, the ⅓ cup salsa, the cumin, and chili powder. Cook and stir about 2 minutes or until heated through. Remove vegetable mixture from skillet. Step 2 In a medium bowl, whisk together eggs, salt, and black pepper. In the same skillet, heat the remaining 1 teaspoon oil over medium heat. Pour in egg mixture. Cook, without stirring, until mixture begins to set on the bottom and around edges. With a spatula or a large spoon, lift and fold the partially cooked eggs so that the uncooked portion flows underneath. Continue cooking over medium heat for 2 to 3 minutes or until egg mixture is cooked through, but is still glossy and moist. Remove from heat. Gently fold in vegetable mixture. Step 3 Spoon about ⅔ cup of the egg mixture down the center of each tortilla. Top with cheese and cilantro. Fold sides of tortillas up over filling. Roll up tortillas starting at one end. Cut in half before serving. If desired, serve with the ½ cup salsa. 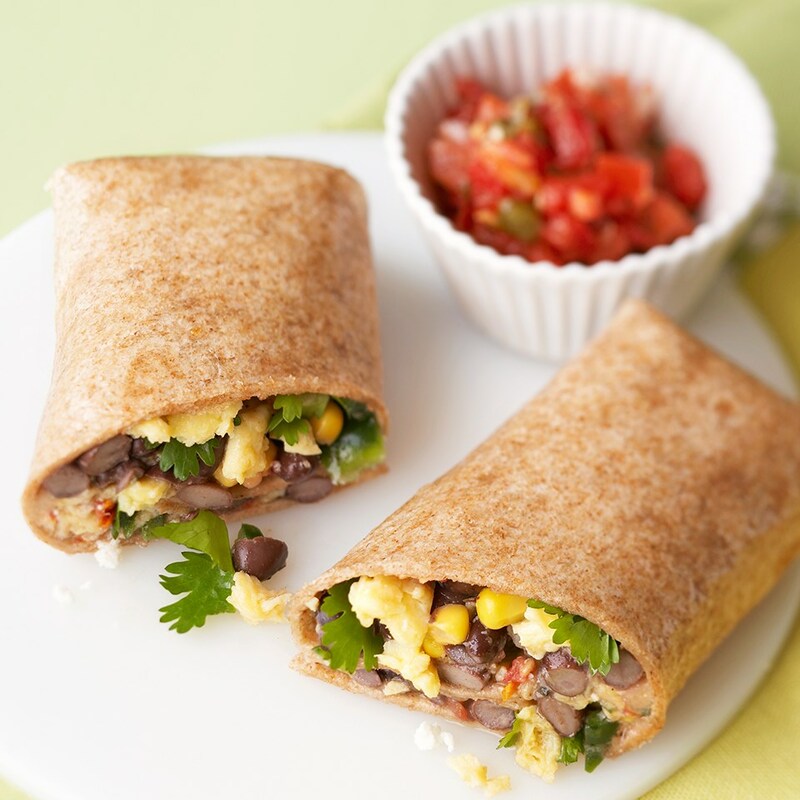 Burritos for breakfast? Loaded with beans, corn, salsa and cheese, this hearty meal will definitely get you up and going.